Nearly 20 environmental and Native American tribal groups are suing the Trump administration for delaying the enactment of legislation limiting the emission of methane gases in drilling operations on federal lands. The lawsuit filed Tuesday in the US District Court for the Northern District of California in San Francisco by the National Wildlife Federation, the Sierra Club, the Environmental Defense Council and a Navajo group called the Dine Citizens Against Ruining Our Environment, targets the US Interior Department, among others, Reuters reported. The suit aims to stop the delay of the rule finalized by former President Barack Obama in 2016 which sought to limit the emissions produced by gas and oil drilling. The legal move seeks to force the Department to implement the regulation in January, the original compliance date. The rule in question targets accidental leaks and intentional venting of methane from drilling operations on public lands, where around 9 percent of the US’ natural gas and 5 percent of its oil were produced during the last fiscal year. Some of its 2017 provisions have already been ditched by the Trump administration, but most of the conditions have not yet gone into effect. The administration is expected to announce a new draft in the coming weeks, said to be in line with its policy of maximizing oil, gas and coal output, while dismantling regulations it says prevent job growth. Earlier this month, the Bureau of Land Management, which is under the Interior Department, paused the implementation of the rule until January 17, 2019. The department said the delay was a measure for energy companies to avoid compliance costs during the period in which the administration revises the regulations. 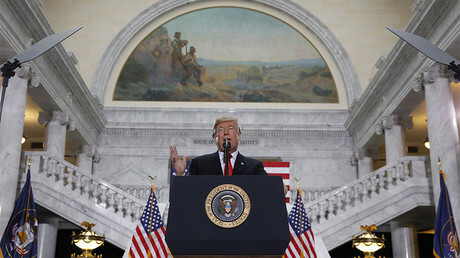 Darin Schroeder, a lawyer with the Clean Air Task Force, which represented the National Wildlife Federation, said the delay “is yet another action taken by the Trump administration to benefit the oil and gas industry at the expense of the American public, particularly the millions of Westerners” who utilize public lands for ranching, hunting, hiking and other purposes, Reuters reported. Energy companies targeted by the Obama-era measure say it could cost them tens of thousands of dollars per well, Reuters reported. In October, a federal judge in California ruled the Trump administration broke the law in June after US Interior Secretary Ryan Zinke first attempted to postpone the compliance date for the methane statute. The judge ordered the law be implemented on its original date in January of 2018, according to The Hill.